ENJOY THE BENEFIT OF FLEXIBILITY – THERE IS NO NEED TO CHOOSE A START DATE FOR YOUR VISIT! Tickets can be used within 14 days from date of first use. First use must occur on or before 12/31/19. ** Valid Theme Park admission and online registration required. Disney FastPass+ attractions and entertainment experiences, the number of selections you can make, and available arrival windows are limited. Disney FastPass+ attractions subject to change. Its massive, it’s magnificent! The Walt Disney World Resort covers over 47 square miles. 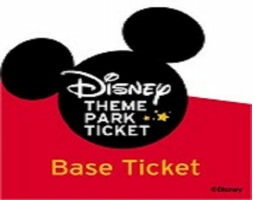 With a Walt Disney World Base ticket you can explore up to 4 major theme parks, Magic Kingdom Park, Epcot, Disney’s Hollywood Studios and Disney’s Animal Kingdom Theme ..
Its massive, it’s magnificent! The Walt Disney World Resort covers over 47 square miles. With a Walt Disney World Hopper ticket you can explore 4 major theme parks, Magic Kingdom Park, Epcot, Disney’s Hollywood Studios and Disney’s Animal Kingdom Theme Park..
Its massive, it’s magnificent! The Walt Disney World Resort covers over 47 square miles. There are 4 major theme parks, Magic Kingdom Park, Epcot, Disney’s Hollywood Studios and Disney’s Animal Kingdom Theme Park. There are also 2 waterparks, Disney’s ..